Thurl Bailey as Goliath in Liken the Scripures Episode 3: One Smooth Stone. 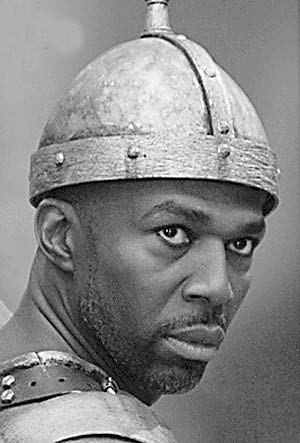 Could anybody have been a more perfect choice to play Biblical giant Goliath than Thurl Bailey? The creators of Liken the Scriptures Episode 3: One Smooth Stone didn’t think so. Bailey has everything in place: a professional singing career, the Herculean strength and height of an NBA player, and a religious background as a member of the LDS Church. He is intimidating, no doubt about it — in physical stature alone. When the 6’11” Bailey performs his solo “I Am Goliath,” his deep baritone booming and his eyes scanning the crowds of Philistine warriors flailing about him, something reaches the children who watch. They, who have heard the story of David and Goliath on a routine basis from the time they were tiny, finally understand how gargantuan, how fierce, and how dangerous Goliath was. Experts have estimated Goliath was somewhere between 7 and 10 feet tall. Bailey isn’t quite that tall, but he provides a measure of understanding of the breathtaking Braun of the Biblical legend. This is the gift of the Liken the Scriptures series; essentially, they are a chance for younger minds to re-explore stories that may have become mundane with repetition or comprehend complicated aspects they’ve never been able to grasp. Goliath’s nemesis, of course, comes in the form of a meek boy named David (Spencer Forsey, whose clear-voiced and humble debut suits the character of David perfectly). David, the small armor-bearer for the reckless King Saul (played beautifully by Daniel Beck), finds himself challenging Goliath with nothing but his faith in his God and one smooth stone. All this is told, as it is in all the Liken the Scriptures productions to date, from the perspective of a young boy named Spencer (Garrett Summers) who turns to scripture to find meaning and strength in his everyday struggles. Now on their third effort (producer Dennis Agle freely admits they weren’t exactly experts when they began the Liken the Scriptures odyssey), the series is settling in comfortably with a unique sense of style; concise writing, a mellow musical tone, and playful direction. But it is steadily improving as well, while drawing from the best elements of its two predecessors. And consistently, technical aspects of these productions are tightening up, costumes are getting brighter, and the entire atmosphere is becoming more natural and amiable with each effort.